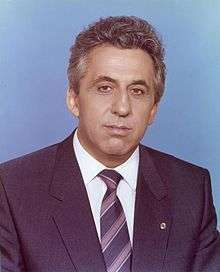 Egon Rudi Ernst Krenz (born 19 March 1937) is a former East German politician who was the last communist leader of East Germany during the final months of 1989. He succeeded Erich Honecker as the leader of the ruling Socialist Unity Party of Germany (SED), but was forced to resign only months later when the Berlin Wall fell. Throughout his career, Krenz held a number of prominent positions in the SED. He was Honecker's deputy from 1984 onward, until he succeeded him in 1989 amid protests against the regime. Krenz was unsuccessful in his attempt to retain the communist regime's grip on power, and was forced to resign some weeks after the fall of the Berlin Wall. After German reunification in 1990 he was sentenced to six and a half years in prison for manslaughter, for his role in the crimes of the government. He retired to the small town Dierhagen in Mecklenburg-Vorpommern upon his release from prison in late 2003. Krenz was born in Kolberg in what was part of Germany, now Poland. His family resettled in Damgarten in 1944. After serving in the Volksarmee, Krenz joined the Socialist Unity Party of Germany (SED) in 1955. Throughout his career, Krenz held a number of posts in the SED and the communist government. He was leader of the Ernst Thälmann Pioneer Organisation from 1971 to 1974, and became a member of the central committee of the communist party in 1973. He was also a member of the People's Chamber (the GDR's legislature) from 1971 to 1990, and a member of its presidium from 1971 to 1981. Between 1974 and 1983, he was leader of the communist youth movement, the Free German Youth. From 1981 to 1984 he was a member of the Council of State. In 1983 he joined the Politburo and became a secretary of the central committee with responsibility for security; the same position Honecker had held before becoming General Secretary. He rose to supreme prominence when he became Honecker's deputy on the Council of State in 1984. Around the same time, he replaced Paul Verner as the unofficial number-two man in the SED leadership, thus making him the second-most powerful man in the country. Although he was the youngest member of the Politburo (and indeed, one of only two people elevated to full membership in that body from 1976 to 1984), speculation abounded that Honecker had tapped him as his heir apparent. Following popular protests against the GDR's Communist government, the SED Politburo voted to remove Honecker on 18 October 1989, and Krenz was elected as the new General Secretary of the SED Central Committee. Krenz had been approached several months earlier about ousting Honecker, but was reluctant to move against a man he called "my foster father and political teacher." He was initially willing to wait until the seriously ill Honecker died, but by October was convinced that the situation was too grave to wait for what he had called "a biological solution." Despite many protests, the People's Chamber elected Krenz to both of Honecker's major state posts—Chairman of the Council of State (a post equivalent to that of president) and Chairman of the National Defence Council. For only the second time in the People's Chamber's forty-year history, the vote was not unanimous (the first was on the law on abortion); 26 deputies voted against and 26 abstained. In his first address as leader, Krenz promised democratic reforms, but few East Germans believed him. For instance, they still remembered that after the Tiananmen Square massacre, he had gone to China to thank Deng Xiaoping on behalf of the regime. For this and other reasons, Krenz was almost as detested as Honecker had been; one popular joke suggested that the only difference between them was that Krenz still had a gall bladder. Indeed, almost as soon as he took power, thousands of East Germans took to the streets to demand his resignation. Also on the same day he took office, Krenz received a top secret report from planning chief Gerhard Schürer that showed the depths of East Germany's economic crisis. It showed that East Germany did not have enough money to make payments on the massive foreign loans that propped up the economy, and it was now DM123 billion in debt. Although Krenz had been the number-two man in the administration, Honecker had kept the true state of the economy a secret from him. Krenz was forced to send Alexander Schalck-Golodkowski to beg West Germany for a short-term loan to make interest payments. However, West Germany was unwilling to even consider negotiations until the SED abandoned power and allowed free elections—something that Krenz was unwilling to concede. On 7 November, Krenz approved the resignation of Prime Minister Willi Stoph and his entire cabinet along with two-thirds of the Politburo. However, the Central Committee unanimously re-elected Krenz to the position of General Secretary. In a speech, Krenz attempted a reckoning with history, which also criticized his political mentor Honecker. Yet, by this stage, events were rapidly spiralling out of his control. Despite promises of reform, public opposition to the regime continued to grow. In an attempt to stem the tide, Krenz authorized the reopening of the border with Czechoslovakia, which had been sealed to prevent East Germans from fleeing to West Germany. The newly formed Politburo agreed to adopt new regulations for trips to the West by way of a Council of Ministers resolution. Egon Krenz addressing the Volkskammer. On the evening of 9 November, the Politburo finished the draft of the new travel regulations, which allowed anyone who wanted to go to West Germany to do so through East Germany's border crossings with official permission. However, no one briefed the Politburo's de facto spokesman, East Berlin party boss Günter Schabowski, that the regulations were going to come into effect the following afternoon. Thus, at the daily press conference, when a reporter asked when the regulations would come into force, Schabowski assumed they were already in effect and replied, "As far as I know—immediately, without delay." Excerpts from the press conference aired on West German television, which was viewable in most of East Germany. This prompted a mass exodus to the Berlin Wall by thousands of East Berliners, believing the statement to be a decision to open the border crossings at the Wall. Krenz and the rest of the leadership were unwilling to order the use of deadly force. Finally, the unprepared and outnumbered border guards, on their own authority, let the crowds pass into West Berlin. The fall of the Berlin Wall destroyed Krenz and the SED politically. On 18 November, Krenz swore in a new coalition government. Instead of an oath, it consisted of a simple handshake. However, it was obvious that the SED was living on borrowed time. The CDU and the LDPD, long docile to the SED, threw out their pro-Communist leaderships and announced that they were leaving the democratic bloc. The new CDU Presidium, under the leadership of Lothar de Maizière, also demanded the resignation of Krenz as chairman of the Council of State and Chairman of the National Defense Council. 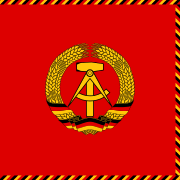 On 1 December, the Volkskammer significantly amended the East German constitution to purge it of its Communist character. Most notably, Article One, which declared East Germany to be a socialist state under the leadership of the SED, was deleted. Two days later, the entire Politburo and Central Committee—including Krenz—resigned and a working committee took over direction of the party. On 6 December 1989, Krenz resigned from his remaining leadership posts. He was succeeded as head of state by LDPD leader Manfred Gerlach. In a desperate attempt to improve its image ahead of East Germany's first free election, the successor organisation to the SED, the Party of Democratic Socialism, stripped Krenz of his party membership in 1990. Served prison sentence 13 January 2000 – 18 December 2003, released on probation until 2006. Released since 2006, sentence served in full. In 1997, Krenz was sentenced to six-and-a-half years imprisonment for Cold War crimes, specifically manslaughter of four Germans attempting to escape East Germany over the Berlin Wall. He was also charged with electoral fraud, along with other criminal offences. He appealed, arguing that the legal framework of the newly reunited German state did not apply to events that had taken place in the former GDR. Krenz also argued that the prosecution of former GDR officials was a breach of a personal agreement given by West German Chancellor Helmut Kohl to Soviet President Mikhail Gorbachev during their talks, which led to German reunification. However, the verdict was upheld in 1999. 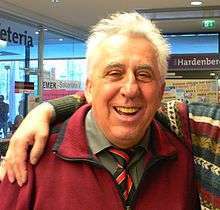 Krenz reportedly described his conviction as "victor's justice" and "cold war in court", saying, "The victorious power is avenging itself on the representatives of the defeated power" (Die siegreiche Macht rächt sich an den Vertretern der besiegten Macht). Krenz began serving his sentence in Hakenfelde Prison shortly thereafter, before he was transferred to Plötzensee Prison, a prison with stricter rules. Krenz's application to the European Court of Human Rights on alleged misuse of GDR criminal laws reached the Grand Chamber, but was rejected in 2001. He was released from prison in December 2003 after serving nearly four years of his sentence, and quietly retired with his wife Erika to Dierhagen in Mecklenburg-Vorpommern. He remained on parole until the end of his sentence in 2006. Unlike other high-ranking former members of the SED, such as Schabowski and Günther Kleiber, Krenz still defends the old East Germany and maintains he has not changed his political views. ↑ East Germany – Politburo. Country-data.com. Retrieved on 5 September 2011. 1 2 3 Sebetsyen, Victor (2009). Revolution 1989: The Fall of the Soviet Empire. New York City: Pantheon Books. ISBN 0-375-42532-2. ↑ "Communism – East Germany". BBC News. Retrieved 1 April 2010. ↑ "Court upholds Berlin Wall convictions". BBC News. 8 November 1999. Retrieved 1 April 2010. ↑ Repeal the racist asylum laws. www.newworker.org (29 August 1997). Retrieved on 5 September 2011. ↑ Krenz, Schabowski und Kleiber hatten sich nichts mehr zu sagen : Textarchiv : Berliner Zeitung Archiv. Berlinonline.de (31 May 2008). Retrieved on 5 September 2011. ↑ "East German leader jailed". BBC News. 14 January 2000. ↑ Neilan, Terence (25 January 2000). "WORLD BRIEFING". The New York Times. ↑ ECHR judgment in the case of Streletz, Kessler and Krenz v. Germany; see also (Italian) Omicidi in nome del muro di Berlino. La “pratica statale” ha violato le leggi. ↑ (German) Ex-SED-Chef: Egon Krenz veröffentlicht Gefängnis-Tagebücher – Nachrichten Politik – WELT ONLINE. Welt.de (13 November 2008). Retrieved on 5 September 2011. Wikimedia Commons has media related to Egon Krenz.